Dr Arthur Ashkin, born in September 1922, pioneered “optical tweezers”, a method of gripping and moving very small objects and living cells using a focused laser beam. He was one of three scientists honoured by the Nobel committee “for ground-breaking inventions in the field of laser physics”. 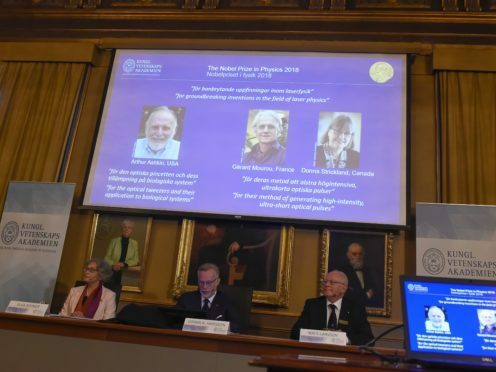 His co-laureates are Professor Gerard Mourou, from the Ecole Polytechnique in Paris, France, and his former student Professor Donna Strickland, from the University of Waterloo in Canada. Prof Strickland is only the third woman in history to win the Physics Nobel prize. Her predecessor was Maria Goeppert Mayer, who won the prize in 1963 for her work on atomic nuclei. Dr Ashkin spent many years working at Bell Laboratories, a subsidiary of Finnish electronics giant Nokia based in Murray Hill, New Jersey, US. Half the nine million Swedish kronor (£770,000) prize money goes to Dr Ashkin with the other half shared equally between Profs Mourou and Strickland for their research on “high-intensity, ultra-short optical pulses”. 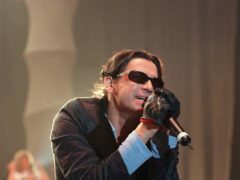 The awards were announced by the Royal Swedish Academy of Sciences in Stockholm. In a call to the Nobel committee, Dr Ashkin said he may not be able to give any interviews because he was “very busy with his latest paper”. Today optical tweezers are used routinely to study proteins, biological molecular motors, DNA and the inner life of cells. They work using radiation pressure to trap and manipulate microscopic particles as small as a single atom. To demonstrate the principle, the awards audience was shown a video of a man levitating a ping pong ball with a hair dryer. Committee member Professor Mats Larsson, a molecular physicist at the University of Stockholm, Sweden, said: “Arthur Ashkin very soon after the first laser had been constructed realised that suddenly there was available a tool of light of a totally different quality than you had earlier. Dr Ashkin developed the first optical tweezers in the 1970s, he said. But the “real breakthrough” came later when the technique was used to manipulate complex objects such as viruses and cells.